Years have passed since Myla Lewis last fought gladiator-style in Purgatory's Arena. Now, she’s fighting again, only this time in Hell. And the stakes have never been higher. 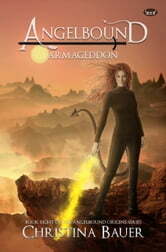 The demon King of Hell, Armageddon, has kidnapped Myla and Lincoln’s young son, Maxon. Don't miss this exciting conclusion to Angelbound Origins! Afterward, Myla and Lincoln's story continues with the next generation in the Angelbound Offspring books.